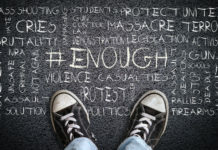 As the number of school shootings continues to take a murderous toll on families across the U.S., it is time for everyone, including doctors, to make a commitment to reducing gun violence NOW. If we were talking about installing cabinet locks to keep toddlers out of cupboards where we store toxic household products, no one would argue. It is our job to help prevent injuries. If we were talking about night lights so that older people won’t trip and fall when they use the bathroom at night, no one would argue. But there are people who will argue that asking or counseling about firearms is not the job of health professionals. What? How can that be? There is an average of 96 deaths due to firearms every day in this country. A large percentage of them are due to suicide. According to the Annals’ article, almost half of these people have seen a physician in the prior month. Every one of those visits was an opportunity to ask about suicidal thoughts and risk factors for successful suicide, such as a firearm in the home. Some of the firearm deaths occur because a child has found a gun in his home or in the home of a friend, or some other place that an inquisitive youngster can’t resist. When kids find these guns, they may pull the trigger and kill themselves or someone else even though they may have been told by mom or dad that if you find a gun, don’t touch it and tell your mom or dad about it. We all remember the horrific story of the 2-year old who shot his Mom to death in Wal-Mart the day after Christmas. He had found her gun in a zippered compartment of her purse and accidentally shot her in the head. According to the newspaper story, the mother had had handgun classes, but who knows if it covered the risks of putting a loaded gun in close proximity to a curious toddler even if she thought it was “concealed”? What if her pediatrician had talked to her about the risks of toddlers and guns at her last visit, letting her know that even toddlers can find hiding places that adults think are safe? Could it have made a difference? We know that perpetrators of mass violence often have a history of domestic abuse. Many health professionals screen for domestic violence, but how often do they take the extra step and ask if there are guns in the home, a circumstance that is supposed to make the abuser ineligible to purchase weapons. Could that reduce, even by a small measure, the number of mass murders in this country? Long after the stories about children killed when their best friend pulls a trigger or concert-goers are gunned down in Las Vegas, survivors and their families will live with the horrendous physical and mental health impacts of gun violence. Most people who survive a gunshot wound to the head will have neurologic deficits, some of which are quite profound. Gunshot wounds to the spine may leave a survivor wheelchair-bound or worse if the injury to the spinal cord was at a high level. The shooting of Senator Steve Scalise highlights the severe injuries that result from being shot in the pelvis, the painful and disabling sequelae of which have been chronicled in the press. Even seemingly “minor” gunshot wounds to the extremities can result in life-altering injuries. Victims of mass murders often suffer severe mental health after-effects such as post-traumatic stress disorder (PTSD) and depression. These are not limited to the surviving shooting victims, but also affect witnesses, even very young children, as well as family members. Finally, victims of shootings and their families often experience long-lasting negative effects on their finances related to the uncovered costs of the injuries, both acutely and over the ensuing months to years, disability, survivor and caregiver loss of income, and more. Hospitalizations alone cost over $700 million dollars not counting costs related to follow-up, readmissions, home medications, and loss of work. Many of these long-term consequences are invisible to most of us because the victims and their families often suffer in silence. Reporters quit calling, friends drift away, social support runs out, and no one thinks (or has the temerity) to ask why a young man is in a wheelchair or on long-term-disability. The headline-grabbing event that caused the physical or mental health injury in the first place is in the distant past for everyone except the victims and their families. So, why don’t we ask our patients about firearms? But, we don’t do it”. Educational materials for both patients and providers are available at the What You Can Do website. You can find them here (the URL is http://www.ucdmc.ucdavis.edu/vprp/WYCD.html ). These materials an help with the discussion. The key, he notes, is to let your patients know that you are asking about firearms because you care about their family’s health and well-being. “Make a commitment to ask your patients about firearms when, in your judgment, it is appropriate, and follow through…Please,” he continues,”make your commitment. There is no better time, and it’s the right thing to do. I wholeheartedly agree. Here’s that link again. There is no better time than now. Originally published Feb. 18, 2018, it has been updated to include information about the newly released patient and provider educational materials available on the What You Can Do Website. I agree. A lot of the time, these gun owners are not educated enough about the responsibility it entails to own a firearm. That is also one of the main reasons why these weapons are misused or placed in the wrong hands. Putting a stop to gun violence is such a wonderful advocacy. Thanks for this article. Please spread the word, James.